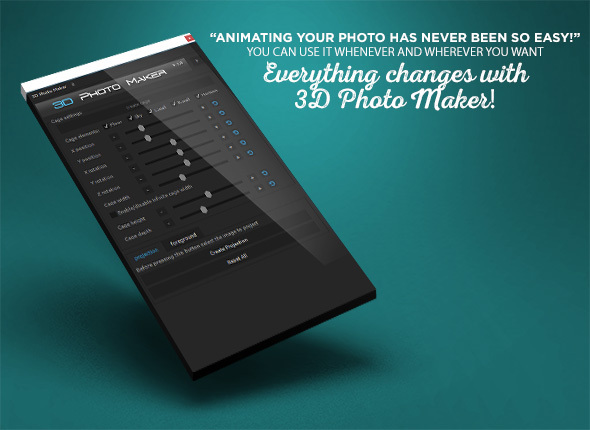 With 3D Photo Maker you can animate your photos in a 3d scene with just a few clicks. The script, compatible with all Windows and Mac systems, was born from the need to always have at your fingertips a tool for turning a simple 2D image in a 3D animated image, recreating a third depth axis. You will thus be free to move your camera in a three-dimensional space, giving “life” to your photos. What are the advantages of a script if compared to a template? Of course, you can use a script in any project. A template can just do the 3d photo transformation, while this script can be opened in any project, even the most complex, letting you do whatever you like to, beside the 3d photo transformation. Another advantage of the script compared to a template is that you never have to go crazy in front of dozens of compositions and precompositions, and the customization is more fast and easy! 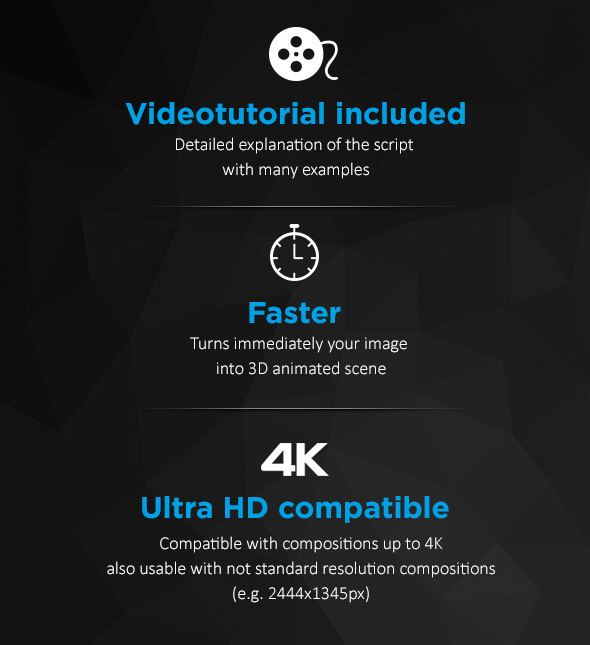 The script does not use expressions which slow down the execution of the animation preview and rendering, so your final render will be very fast! The script performs all these calculations instantly without overburdening your project! How does 3D Photo Maker work? 3D Photo Maker has been optimized to make your job very easy. The only thing you have to do is to align a grid: that this script will automatically create, over the image that you want to project in 3D. To do this, you can use simple control sliders in the script window. Once you have done this, you only have to press the “Create Projection” button. Your image will be projected instantly in a 3D environment. It is also very easy to insert elements in your scene in fact you just need to open the “Foreground” tab, place infinite objects and then, using a slider, move them in the 3D space just created. 3D Photo Maker gives you also the possibility to choose which elements of the perspective grid to animate. For example, you can choose to only animate a grass field, leaving all the other elements of the scene still…Or even choose to animate only the sky (see the example below). As you are working in a 3D environment, you can enable and animate the depth of field of the camera. This operation will get an even more realistic effect.